Bring favorite vacation photos out of your phone's storage and onto this creative photo art piece. Bring favorite vacation photos out of your phone's storage and onto this creative photo art piece. 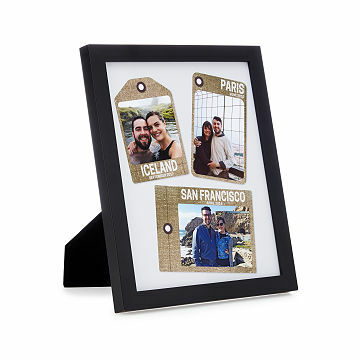 Whether you're climbing mountains or lounging in beach chairs, the design displays your pictures (no matter what size) in either neutral or color travel tags. Personalize the tags with a location and date: you can showcase snapshots from several trips over the years, or just one magical adventure. Whether you choose the 11x14 wall-mounted frame (6-8 photos) or the 8x10 desktop version (3-5 photos), owning this keepsake is sure to inspire the question, "Where to next?" Printed and Framed in Portland, Oregon. See our Photo Art Guidelines for information about size requirements and tips on how to collect photos. Received this as a gift? Follow the instructions in this PDF to customize your travel tag art. Check out the Personalized Travel Tags Photo Art: Color here. Dampen a soft, lint free cloth with warm water or mild solution of dish detergent and water to remove dust and dirt from the frame or acrylic. 3-5 photos come framed with easel back and ready to hang. 6-8 photos come framed and ready to hang.